TLN Mobilicat is a professional internship program that offers the opportunity to have a real work experience in another European country, within the chosen sector. Participants will design and plan a personalized professional itinerary and will be able to develop personal and professional skills and abilities that will improve their access options to the labor market. This international mobility program includes an intensive language course of 120 hours before the starting date of the internship and 40 hours during the stay. The participants will also receive personalized professional guidance throughout the process. 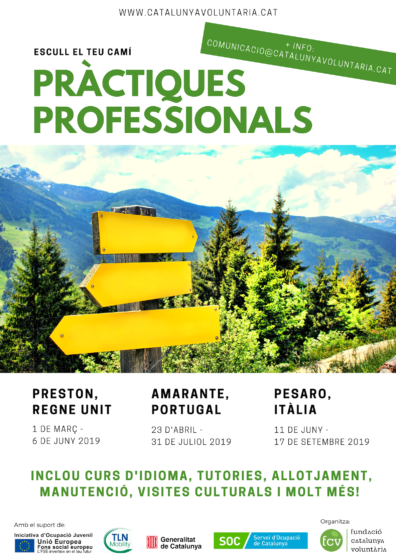 The professional training, as well as all the expenses of the participants (accommodation, pocket money, medical insurance, linguistic support, trip, local transport, mentoring, etc.) are financially supported by the TLN Mobilicat program, which is promoted and co-financed by Sevei d’Ocupació de Catalunya -SOC- and the European Social Fund. More information about the program and the inscriptions here.